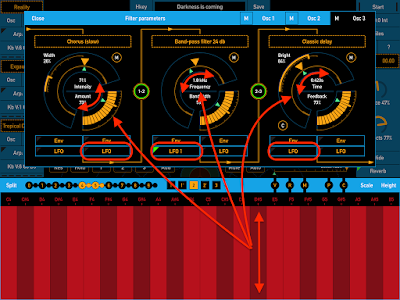 SynthScaper has special parameters "Effect" that are intended for changing several other parameters at once. 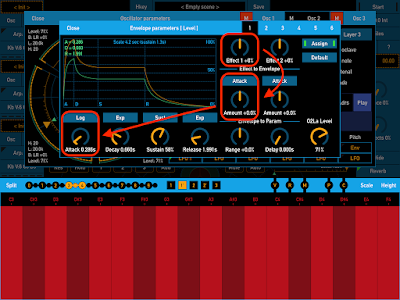 This feature gives you possibility to create complex sound effects which controlled by single parameter. 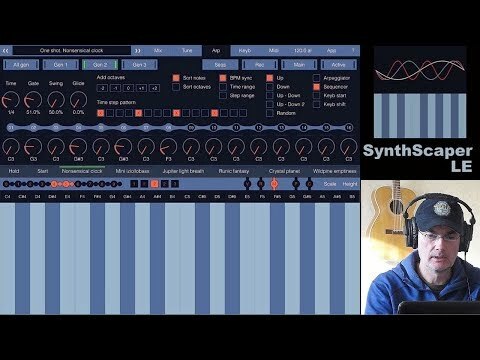 SynthScaper - Soundscapes synthesizer specially designed for creating and experiments with ambient soundscapes in wide range from noises to melodic instruments and everything in between. The parameter "Effect" itself does not change anything, but you can assign it to control other parameters in different ranges. Each oscillator has two effect parameters - "Effect 1" and "Effect 2". Each of it can change one or several parameters of oscillator and filters. 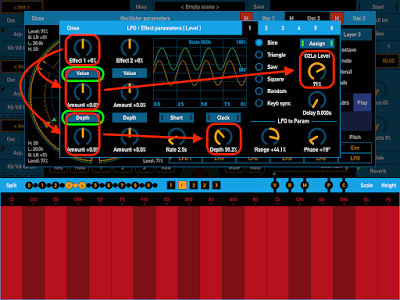 By default vertical moving on the screen keyboard change operating (not current) value of parameter "Effect 1" for all oscillators. Effect shifts the operating value of assigned parameters relative of their current value. 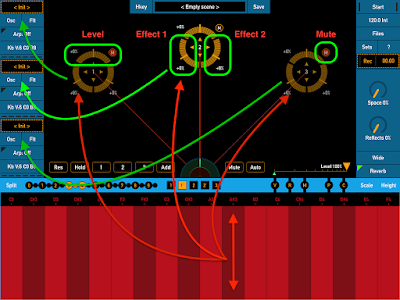 The range of shift defined by the parameter "Amount" which is in the panels "LFO" and "Envelope". In these panels you can assign effect on specific parameter. The operating value of oscillator or filter parameters can differ from the current value and indicated by a green marker next to the current value. 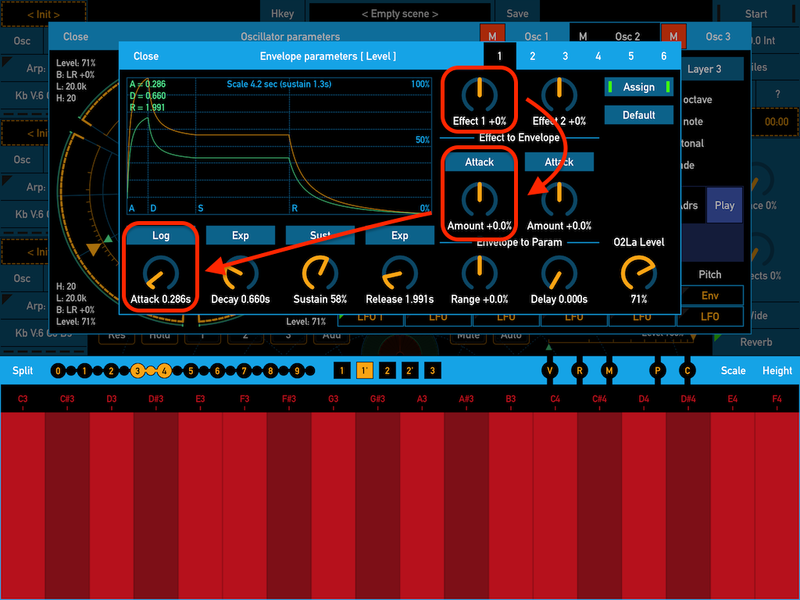 But other than the effect this value also can be changed by LFO and Envelope generator. In the panel "LFO" you can assign effect to the parameter value or to the value of range in which LFO will change this parameter or to the value of phase of LFO for this parameter. 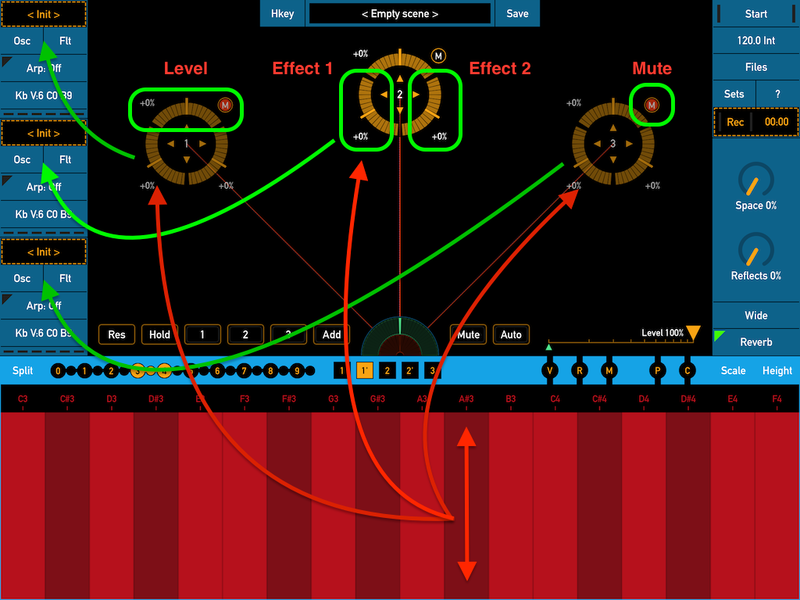 Also in this panel you can assign effect to change the value of depth or rate of selected LFO. Destination parameter selects by button above the knob "Amount". To assign effect to this parameter just set the "Amount" value differ from "0%". The default value of effect is "0%" and effect does not change the operation value of destination parameter. When the effect is positive, this increases operating value of assigned parameter. When negative - decreases. Direction can be inverted by parameter "Amount". When amount value is "+100%" and effect value is "+100%" the assigned parameter will set to the maximum value. When effect value is "-100%" the assigned parameter will set to the minimum. In the panel "Envelope" you can assign effect to change one of envelope parameters - Attack, Decay, Sustain or Release. Please note: Effect knobs on all LFO and Envelope tabs (tabs 1 - 6 at the top of panel) have the same value. This is the same knob but only placed on each tab for checking how the effect changes specific parameter. Also this knob is identical to the elements "Effect" on the ring controls in spatial mixer (on the main screen). There is an easy way to start use effect for changing one or several parameters when you sliding vertically on the screen keyboard. Choice the parameter on oscillator or filter panel that you want to change. 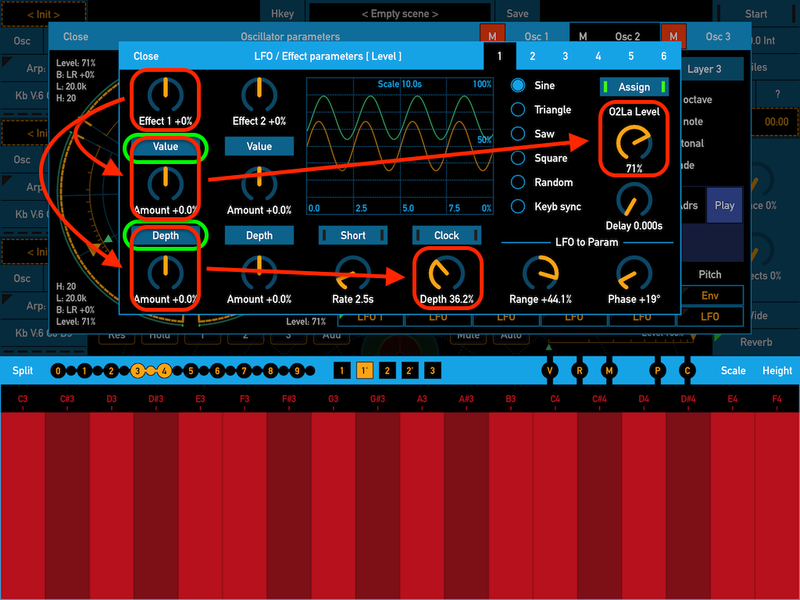 Tap button "LFO" below this parameter (or button below the title of this parameter). Make sure that knob "Effect 1" is set to "0%". Make sure that button above "Effect 1" has name "Value" (otherwise tap to this button to change destination parameter). Then set the knob "Amount" to value differ from "0%". At first to the "+100%". Move vertically on the screen keyboard. 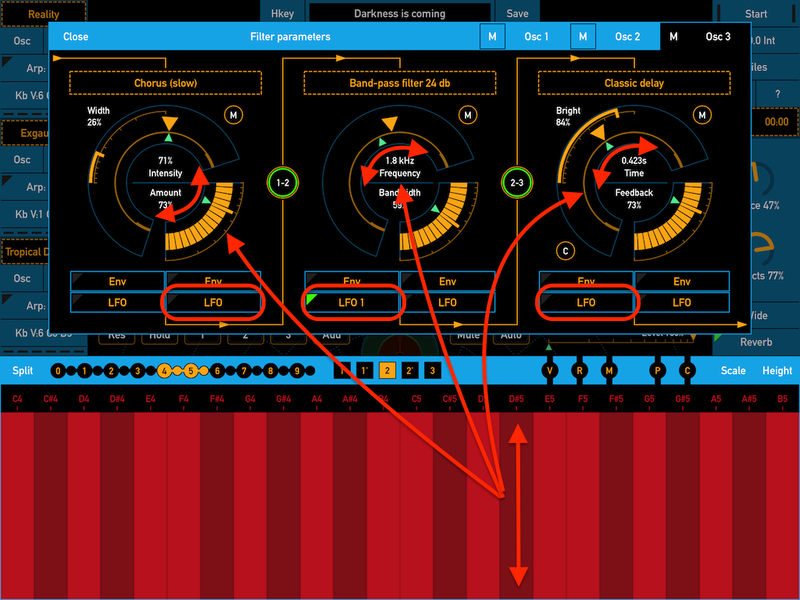 See and listen how this change the parameter and sound. You can repeat these steps for other parameters. In this case you can change several parameters at the same time.